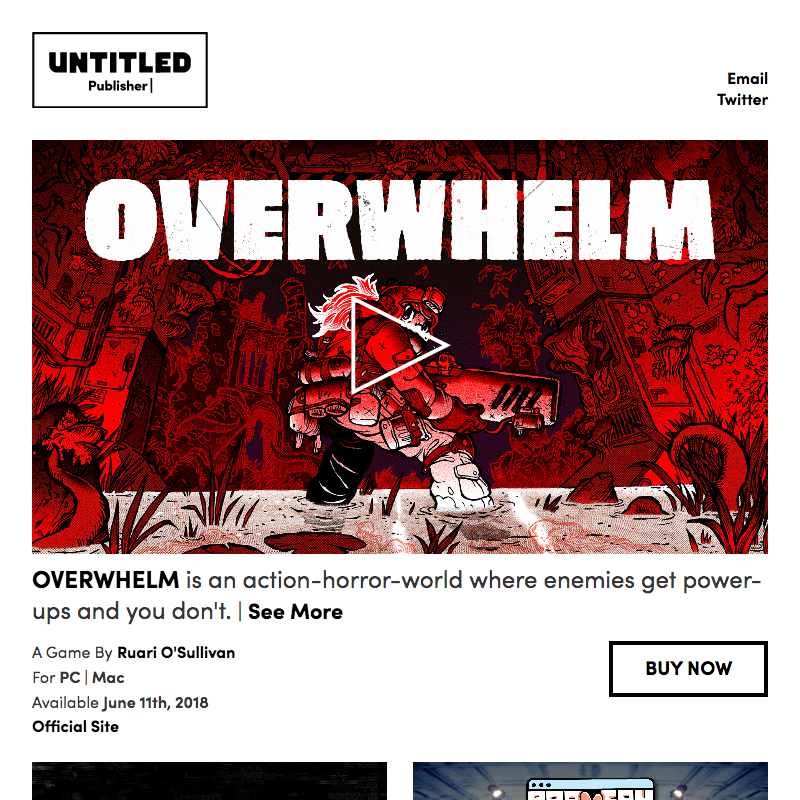 I made Untitled Publisher’s site as part of their company and brand announcement. Based on brand work by Kyle McKernan and Chris Dwyer, I built a responsive site with pages for each game and a user-friendly backend. I like the way the key art reveals a short video loop on hover/touch, and then plays a trailer on click/tap. 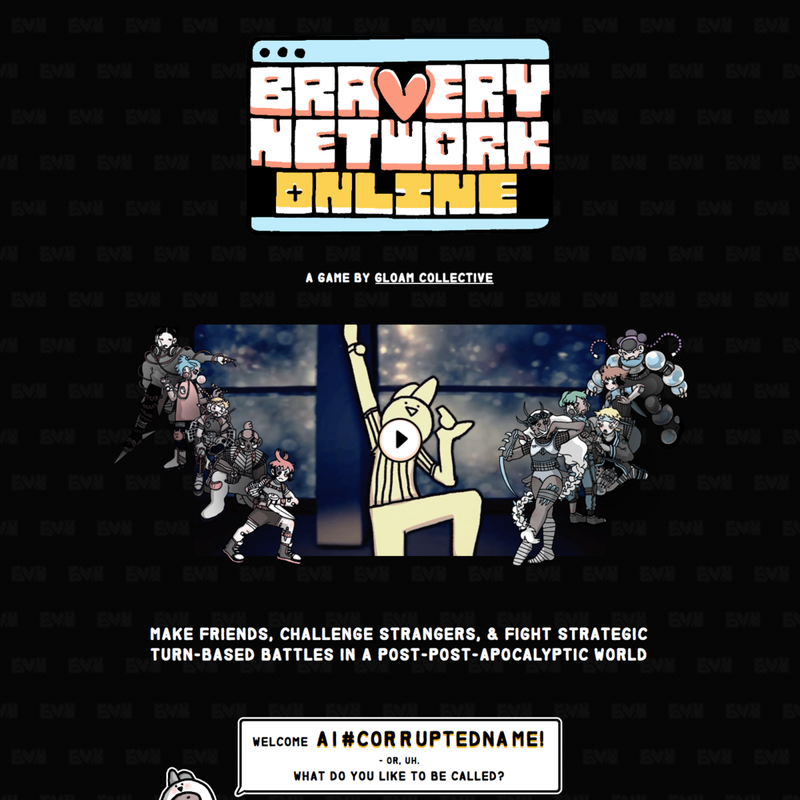 Responsive promotional site for Bravery Network Online by Gloam Collective. Gloam provided the art and basic layout as a Photoshop file, which I re-implemented and expanded as a responsive site. In addition to small animations throughout the site, I coded the dialog interaction that gives a little of the flavor of the game on the way to a newsletter signup. 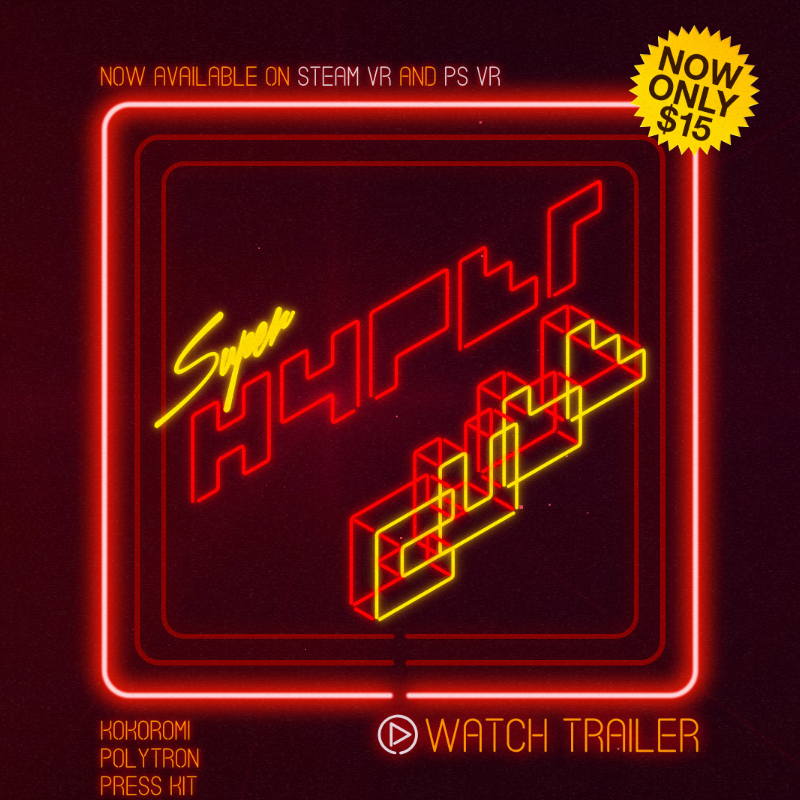 Responsive promotional site for Superhypercube by Polytron. I based the UI on the game’s aesthetic, working with Phil Fish to meet their needs. There’s a pseudo-3D CSS animation, perspective shifting based on mouse position or device tilt, and a lot of sleight of hand to achieve the glowing, film grain aesthetic in a performant way. Responsive promotional site for Mineko's Night Market by Meowza Games and Kukubee. Meowza provided the art and layout as a Photoshop file, which I re-implemented as a responsive site. I animated various elements, including parallax scrolling on the header, squishy buttons, and wiggling stars. This is an info site and Pokédex-like companion web app for Kitfox Games’ streaming game BadCupid. The design was provided by Xin Ran Liu. Working with developer Marcelo Perez of Kitfox, I built the app to use data from the live game, so all changes made to the game’s contents are reflected in the app automatically. I also integrated the site with Microsoft’s Mixer API, to show additional data on the site if a player is logged in to Mixer and has a paid subscription to the game. I built the app in Vue.js and used Popmotion.js/Pose to create the transitions. I learned a lot on this project and am really pleased with how it turned out! Responsive promotional site for Caves of Qud by Freehold Games. They had installed a basic Wordpress template, which I re-designed to match the game's aesthetic. I also worked with the Freehold team to help determine what content to display, and how. I'm particularly pleased with the scanline effect, which is just made of CSS styles, and the Roadmap page, which needed to display a lot of information in a concise format. Responsive web application for OOTU, inc. I developed this application in vue.js to work with OOTU's database backend via JSON APIs. xray.games is a tool for finding video games you'll enjoy by defining and exploring unorthodox connections between them. The application shows information about games and their Traits, allows you to explore the database through multiple avenues, and add Trait-to-game relationships. Emphasis on smooth animation, response time, and user experience. Responsive site based on Action Button Entertainment's game VIDEOBALL. 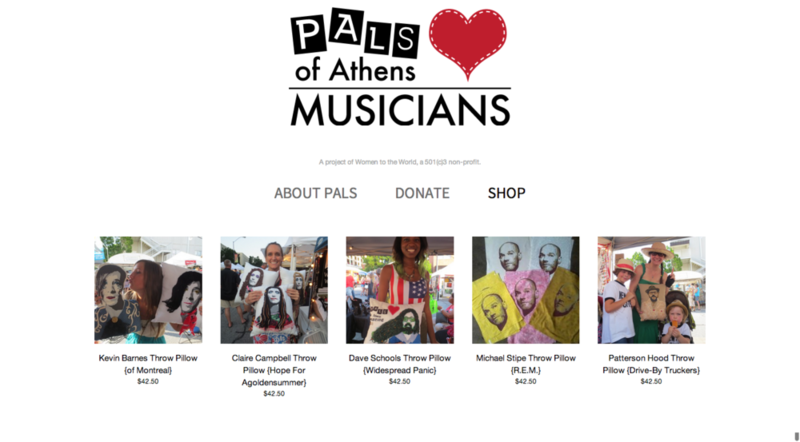 Working under director Tim Rogers, I assembled this site in just a couple of weeks. I created the GIF for the title bar, and re-created many aspects of the game's UI in HAML/SCSS. As of May 2015, I've replaced most of the graphics with SVG, and am adding additional dynamic content. I used ScrollMagic to create the effect of the red and blue circles coming together at the bottom of the page. There's a ScrollTrigger-based CSS animation for the sticky header. CSS animations create other effects throughout the site, including the mobile menu, SVG mobile menu button, and other touches. All site content is editable by the client through a customized Kirby backend. Responsive personal site for video game producer Felix Kramer. Built on the excellent Kirby CMS, which I chose for its flat-file system and ease of client upkeep. Easily-maintained blog, portfolio, and other pages. Used Barba.js to progressively enhance page transitions, and anime.js to create subtle mood animations. Responsive promotional site for Dim Bulb's upcoming game Where the Water Tastes Like Wine, directed by Johnnemann Nordhagen of Gone Home. Used ScrollMagic to create a scrolling reveal at the top of the page. December 2015. 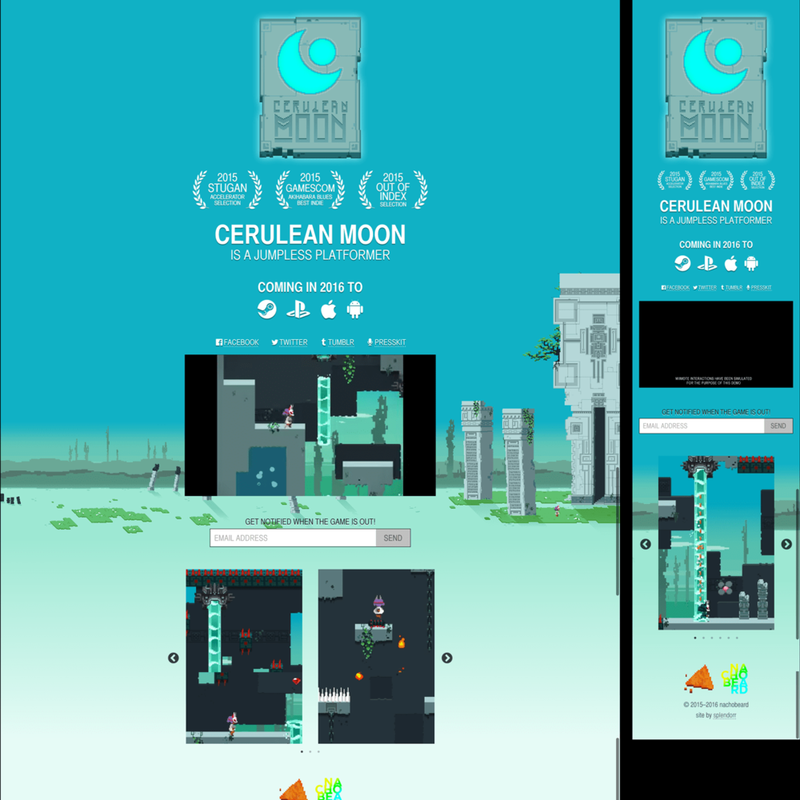 Responsive promotional site for Nachobeard's upcoming game Cerulean Moon. May–June 2015. Updated February 2016. I used this project as a chance to learn a new set of tools based on Node.js. I'm really pleased with everything I learned, and how the site turned out. Art by David Hoskins. I laid out the full vinyl packaging for Double Ferrari's self-titled debut album, including sleeve, liner notes, and side labels. Then I took the cover art, separated it into layers of color, and made a promotional website at doubleferrari.com that moves in relation to mouse movement or device tilt. I'm so proud of this project! Illustrations by Erin Stacer. 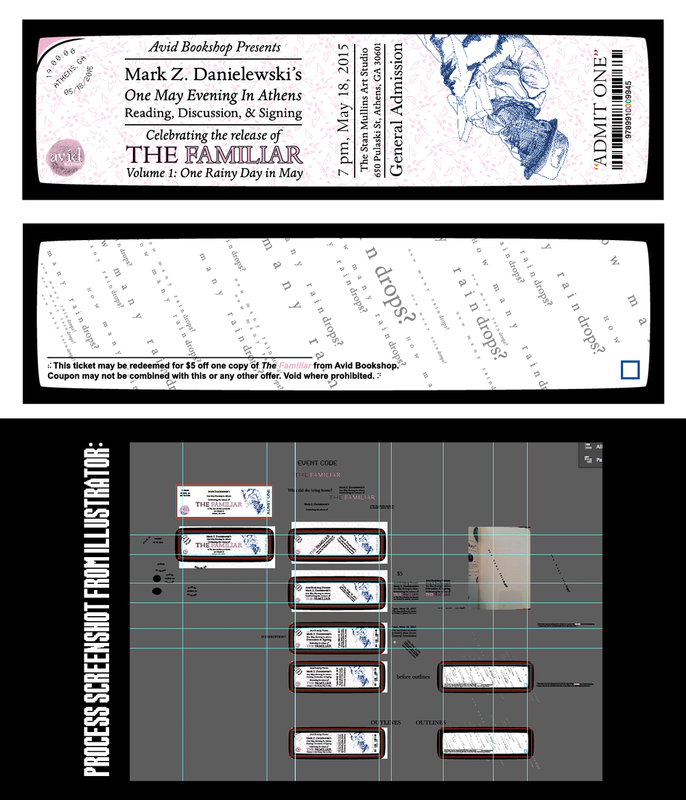 I laid out multiple variations of the design, and prepared the art for printing. Download the album on Bandcamp. Worked with Jace Bartet from the band to design this shirt. His request was, "Like a NASA shirt from the 80s, but even more rock and roll." I think we nailed it, and the first printing sold out almost immediately. Multilingual, responsive site for Japanese-based publisher DANGEN Entertainment. The backend allows the client to add and maintain game pages, blog posts, and other information in English, Japanese, and additional languages. I worked with DANGEN to design something that would express their values of traditional respect and dignity as applied to the modern realm of video games. I also helped DANGEN find another company to help develop their branding. Responsive promotional site for middle grade author Caleb Zane Huett. We worked together to implement his vision of a site that he hoped would be a modern version of the "classically-bad website." The goal was to communicate his humor and warmth as succinctly as possible, while generating interest in his forthcoming book Top Elf. (I've read early drafts; it's funny!) I used modern web animation techniques to evoke the sort of brokenness associated with late-90s personal sites. If it looks broken, we did it on purpose! 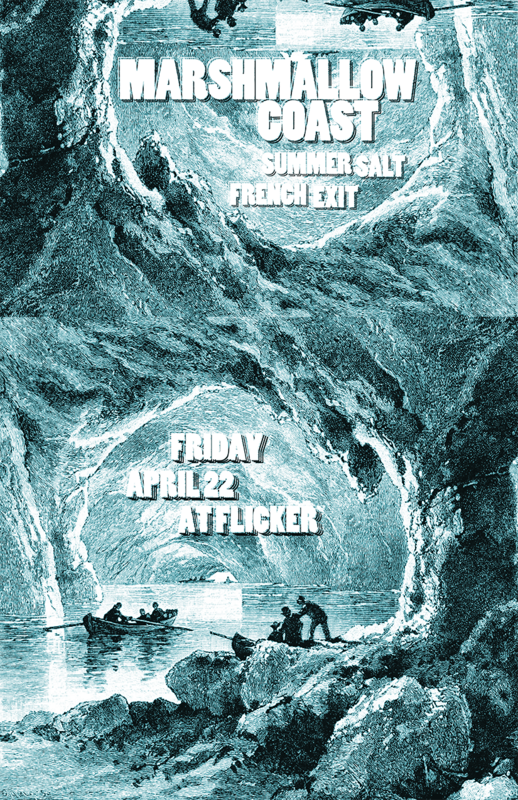 There are things that happen when you click, text you can reveal by highlighting, and various other silly things. We laughed a lot while making this! 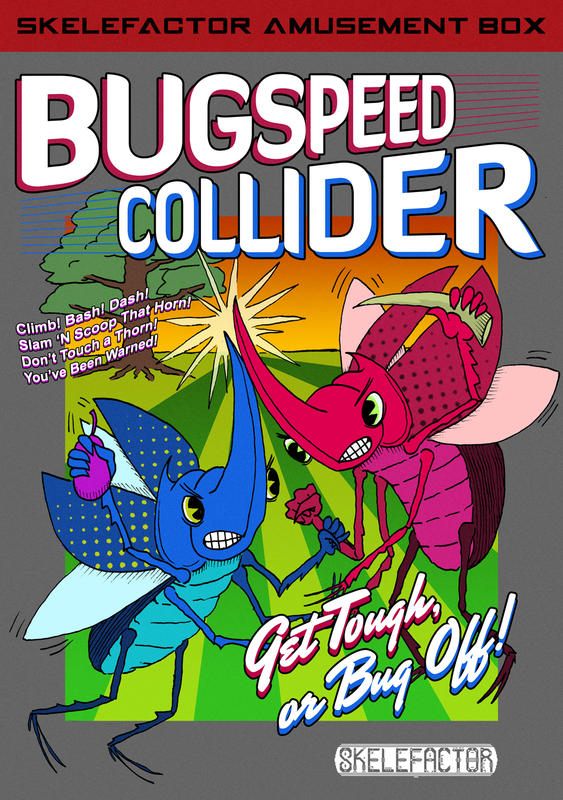 One of several sites I hand-coded in 2013 for Action Button Entertainment. I designed zggrt.com to be fast, clear, and visually-striking, and to work well on all screen sizes. Back-end content and distribution was provided skillfully by Mike Huffman at OOTU. View an example live site here. Responsive site for Squire.co. I'm working with the head of the company, Chris Dwyer, to gradually iterate on this portfolio of Squire's work. My friend Caleb Zane Huett and I do a podcast about Sonic the Hedgehog (mostly). I made this album art in Photoshop, and I record/edit the podcast in Reason. There's technically a web site, but it's just a Podcast Generator template, because hey: I make web sites all day for work. When I'm at home, I just want to podcast. Here's the iTunes feed, or you can search your favorite podcast app. My second podcast with friend and collaborator Caleb Zane Huett. This one's mostly about playing the Persona games by syncing up the real and game world calendars. Illustration by Erin Stacer. 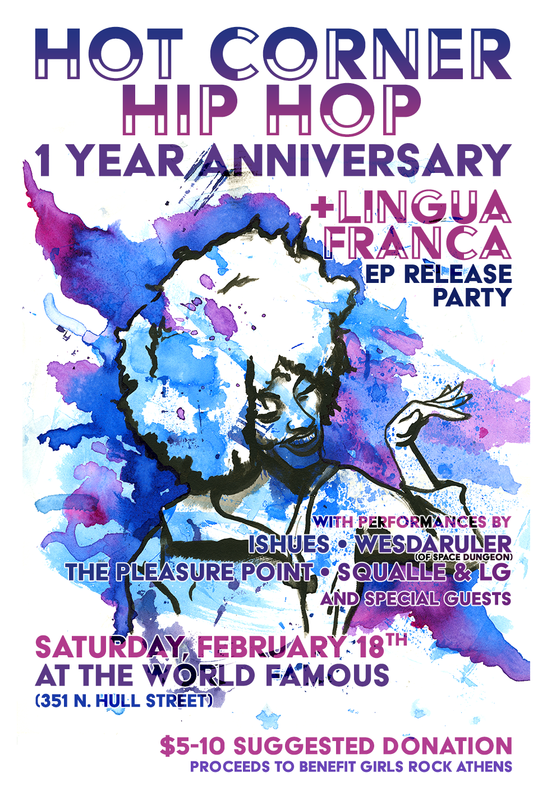 I designed and laid out the flyer for printing. Responsive application test built in React. I coded this in a few days, with the goal of emulating Medium's highlighting & commenting system. Far from perfect, but I started out knowing nothing about React, and learned a lot along the way. Highlight some text and add comments in real-time. I'm not moderating the comments very often, so apologies if anyone posts something rude! December 2015. View the project on Heroku. While listening to Miley Cyrus & Her Dead Petz, I made this collage, then drew it, then combined them. Logo and identity for a Montessori school in Athens, GA. Balancing organization and peace with a sense of fun and hands-on learning. Custom geometric pattern filled with hand-drawn colored pencil. Working with my frequent collaborator Brent Blalock, we made this logo for Athens-based producer and audio engineer Joel Hatstat. More information and images from my collaborations with Brent. I've done a variety of jobs for Coleman Barks and his personal press, Maypop Books. 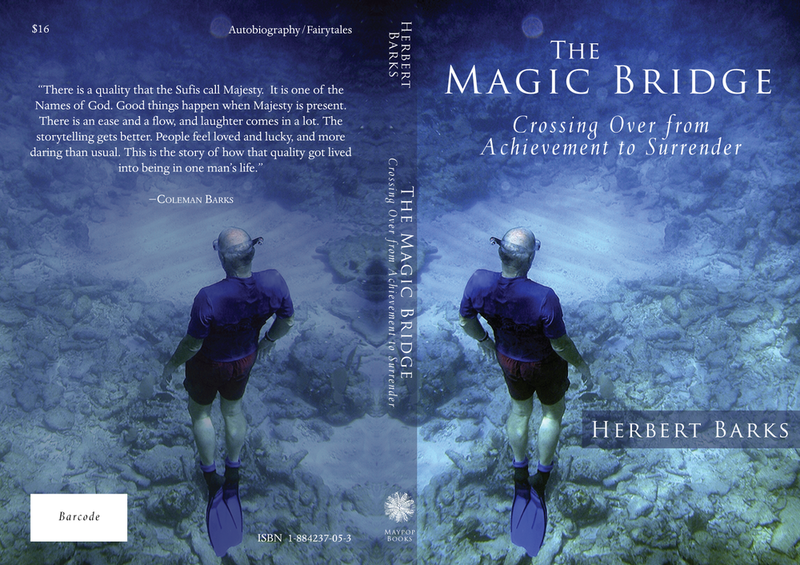 This was a book written by Coleman's brother, Herbert, that I proofread, laid out, and designed inside and out. The book was printed by Thomson-Shore. Photograph by Jamie Walker.